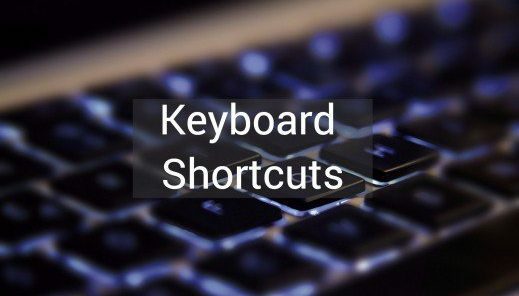 These shortcuts can provide an easier and quicker method of using computer programs. These commands are commonly accessed by using the Alt ket (on PC computers), command key (on Apple computers), Ctrl, and Shift in conjunction with a single letter. 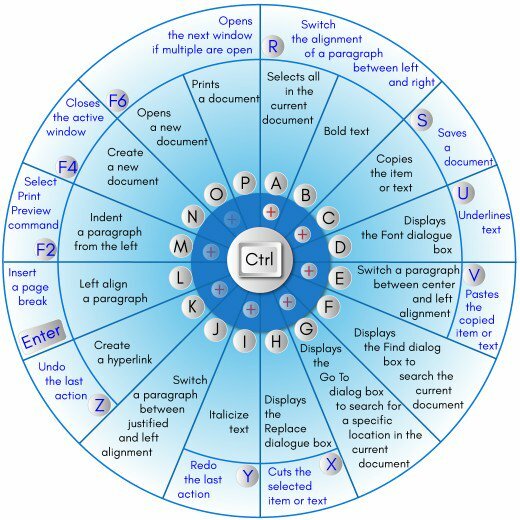 This image shows multiple shortcuts to a variety of functions that you can do in Microsoft Word. MS-Word is one of the best and most using writing programs invented by Microsoft. It’s consisting about 95% of the writing software in computer PC around the world. Writing something in a computer, one must have known the shortcut key of Microsoft word or MS Word. So if someone wants to be a grate writer on MS Word, He must memories this short cut keys. N: B: it is necessary to become handy at the knowledge of keyboard keys. All banks and government office now use computer and they require from you to skill at using keyboard cleverly and greatly. Who is more skilled in keyboard shortcut or he who knows more about keyboard, obviously he is one-step ahead from others. Which is function keys, which is numeric keys, which is the alphabet keys, everything is necessary to know for job seeker in this day. So, learn these very attentively and do practice everyday. Practice makes a man perfect. While it is necessary to learn than why do you not use it in your daily life? Keyboard Shortcuts and System Commands for Popular Programs. F1 key: Get help on a selected command or use the Office assistant. Shift and F1 Key: Review text formatting. F3 Key: Insert an auto text entry. Shift + F3 Key: Change the case of the selected text. F4 Key: Perform last action again. Shift + F4 Key: Perform a Find or Go To action again. F5 Key: Displays the Go To dialogue box. You can also get to Find and Replace from here. Shift + F5 Key: Move to a previous revision. F6 Key: Go to the next frame or pane. Shift + F6 Key: Go to the previous frame or pane. F7 Key: Launch the Spell Checker. Shift + F7 Key: Launch the Thesaurus. F8 Key: Extend the current selection. Shift + F8 Key: Shrink the current selection. Shift + F9 Key: Switch between a field code and its result. Shift + F10 Key: Display a Shortcut Menu (same as right-clicking). F11 Key: Go to the next field. SHIFT + F11 Key: Go to the previous field. F12 Key: Open Save As, equivalent to tools menu. Shift + F12 Key: Save document, equivalent to tools menu. Ctrl and A: Selects all in the current document. Ctrl and B: Bold text. Ctrl and D: Displays the Font dialogue box. Ctrl and E: Switch a paragraph between center and left alignment. Ctrl and F: Displays the Find dialog box to search the current document. Ctrl and G: Displays the Go To dialog box to search for a specific location in the current document. Ctrl and K: Create a hyperlink. Ctrl and L: Left align a paragraph. Ctrl and N: Create a new document. Ctrl and P: Prints a document. Ctrl and R: Switch the alignment of a paragraph between left and right. Ctrl and S: Saves a document. Ctrl and U: Underlines text. Ctrl and V: Pastes the copied item or text. Ctrl and X: Cuts the selected item or text. Ctrl and Y: Redo the last action. Ctrl and Z: Undo the last action. Ctrl and Enter: Insert a page break. Ctrl and F2: Select Print Preview command. Ctrl and F6: Opens the next window if multiple are open. Windows Key + D: Hide/display the desktop. Alt + Esc: Switch between programs in order they were opened. Alt + Letter: Select menu item by underlined letter. Ctrl + Esc: Open Start menu. Ctrl + F4: Close active document (does not work with some applications). Alt + F4: Quit active application or close current window. Alt + Spacebar: Open menu for active program. Ctrl + Left or Right Arrow: Move cursor forward or back one word. Ctrl + Up or Down Arrow: Move cursor forward or back one paragraph. F1: Open Help menu for active application. Windows Key + M: Minimize all windows. Shift + Windows Key + M: Restore windows that were minimized with previous keystroke. Windows + F1: Open Windows Help and Support. Windows + Tab: Open Task view. Windows + Break: Open the System Properties dialog box. Hold Right SHIFT key for eight seconds: Switch FilterKeys on and off. Left Alt + Left Shift + Print Screen: Switch High Contrast on and off. Left Alt + Left Shift + Num Lock: Switch Mouse keys on and off. Press Shift five times: Switch Sticky keys on and off. Hold Num Lock for five seconds: Switch Toggle keys on and off. Alt + Left Arrow/Backspace: Go back to the previous page. Alt + Right Arrow: Go to next page. F11: Toggle between full-screen and regular view. Esc: Stop downloading a page. Ctrl + ( + or -): Zoom in or out of page by 10%. Ctrl + Enter: Adds www. at the beginning and .com to the end of any text entered in the Address bar. Ctrl + D: Add the current site to your favorites. Ctrl + I: View your favorites. Ctrl + P: Print the current page. Ctrl + F4: Closes tabs in the background. Spacebar: Click the notification bar. Shift + Spacebar: Move up one page. Alt + Down Arrow: Move a selected item down the favorites list. End: Display bottom of current window. Home: Display top of current window. Left Arrow: Collapse the current selections or select a parent folder. Right Arrow: Display the current selection or select the first subfolder. Type the following commands in your Run dialogue box (Windows Key + R) to run specific programs. F2: Edit the active cell. F5: Displays the Go To box. F7: Open the Spelling dialogue box to check a selected range. F11: Create a chart of data in the current range in a separate sheet. Alt + Shift + F1: Insert a new worksheet. Shift + F3: Opens Insert Function dialogue box. Shift + F5: Opens the Find and Replace dialogue box. Ctrl + Shift + Colon (:): Enter the current time. Ctrl + Semicolon (;): Enter the current date. Ctrl + A: Select all content in the worksheet. Ctrl + B: Bold highlighted selection. Ctrl + I: Italicize highlighted selection. Ctrl + K: Open the Insert hyperlink dialogue box. Ctrl + U: Underline highlighted selection. Ctrl + 5: Apply strikethrough formatting. Ctrl + P: Brings up the print dialog box. Ctrl + F9: Minimize a workbook window to an icon. Ctrl + F10: Maximize a selected workbook window. Ctrl + F6: Switch to the next workbook window when multiple are open. Ctrl + Page Up: Move to previous sheet in a workbook. Ctrl + Page Down: Move to next sheet in a workbook. Ctrl + Tab: Switch to next tab in dialogue box. Ctrl + Apostrophe (‘): Insert the value of the above cell into the cell currently selected. Ctrl + Shift + ! : Apply the Number format. Ctrl + Shift + $: Apply the Currency format. Ctrl + Shift + #: Apply the Date format. Ctrl + Shift + %: Apply the Percentage format. Ctrl + Shift + ^: Apply the Exponential format. Ctrl + Shift + @: Apply the Time format. Ctrl + Arrow Key: Move to the edge of the current data region in a worksheet. Ctrl + Space: Select an entire column in a worksheet. Shift + Space: Select an entire row in a worksheet. Command + X: Cut selected text and copy it. Command + C: Copy selected text. Command + V: Paste copied text. Command + Z: Undo previous command. Command + A: Select all items. Command + F: Open Find window to search text. Command + H: Hide windows of the front app. Command + N: Open a new document or window. Command + O: Open a selected item. Command + P: Print current document. Command + S: Save current document. Command + W: Close front window. Command + Q: Quit the app. Command + M: Minimize the front window to the Dock. Command + Spacebar: Open Spotlight search field. Command + Tab: Switch between open apps. Command + B: Bold selected text. Command + I: Italicize selected text. Command + U: Underline selected text. Command + Semicolon (;): Find misspelled words in document. Option + Command + Esc: Choose an app to force quit. Shift + Command + Tilde (~): Switch between open windows. Shift + Command + 3: Take a screenshot. Fn + Up Arrow: Scroll up one page. Fn + Down Arrow: Scroll down one page. Fn + Left Arrow: Scroll to beginning of document. Shift + Command + F: Open All My Files window. Shift + Command + K: Open Network window. Option + Command + L: Open Downloads folder. Shift + Command + O: Open documents folder. 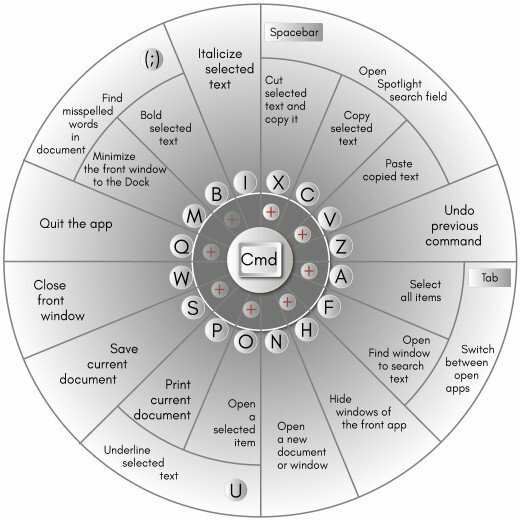 Shift + Command + U: Open Utilities folder. Option + Command + D: Show or hide the Dock. Shift + Command + N: Create a new folder. Command + Delete: Move selected item to the Trash. Shift + Command + Delete: Empty Trash. This will create a shortcut named “Shortcut to <your program>” in the directory you are in. If you wish to rename this shortcut, right-click the file and click Rename. Once the above steps have been completed, you can copy this shortcut and paste it anywhere to execute this program. Once the shortcut has been created, you can assign a keystroke to that Windows shortcut. Click in the Shortcut key box and press a letter. For example, if you press “p”, the shortcut key will automatically be made to Ctrl + Alt + P. Which means that if saved, pressing Ctrl and Alt and P will run that shortcut. You can follow us on Facebook, Twitter, Pinterest, GooglePlus, Instragam and many more social site. We are present everywhere and share our knowledge to everyone. Trying help every learned personal in a precise way so that everyone can achieve success in all academic and other experiment of life. Please share our post to your friends and family so that they can learn and also inspire us to publish more helpful information.